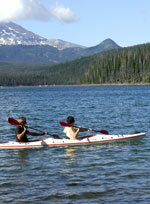 Central Oregon and Sunriver offer some of the most spectacular vacation activities to be found anywhere! Here are just a few tips, links and suggestions to help you plan your vacation. Our homes in Sunriver are located right in the heart of everything Central Oregon has to offer, from skiing and snowboarding at Mt. Bachelor to over 20 area golf courses. There's also hiking, biking, whitewater river rafting, fly fishing along the Deschutes River and so much more. Enjoy! Opportunities for central Oregon fishing abound. The Cascade Lakes, the Deschutes River, Paulina and East Lakes and the Crooked River provide almost endless opportunities for the avid angler. These waters also provide a playground for whitewater kayaking, flatwater kayaking and canoeing, standup paddleboarding, windsurfing and sailboating. Organizations providing group tours from Sunriver include Sun Country Tours, Wanderlust Tours, our favorite the Paulina Plunge, and Central Oregon Adventures. Once you arrive at Sunriver you will have an opportunity to explore the options and find activities that fit into your schedule and meets the needs of your group. The High Desert Museum between Sunriver and Bend is a favorite family activity. There are indoor and outdoor exhibits, a variety of wildlife exhibits and shows, and an extensive living history section with volunteers dressed in era costumes engaged in era activities. Try your hand at pioneer activities or watch a 100 year old, steam-powered saw mill with 48 inch blade in action. If you are specifically interested in central Oregon history, you will enjoy the Des Chutes Historical Museum in Bend.